Note to readers: This section contains many photos so is relatively slow to load - on my machine it takes about 5 minutes with a 33600 modem connection. However, if I let it load as I read through the text on each photo, it loads ahead of me. I suspect this is what many of you will be doing so it will not be a problem. However, I want this to work well for you, so if loading speed is a problem, please email me and I'll see if I can modify things. 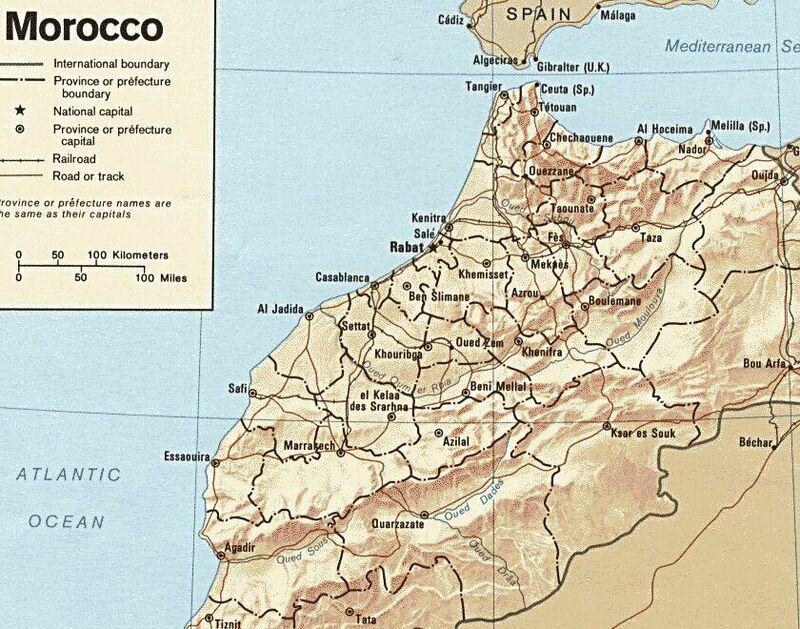 To locate some of the towns I mention below, you can click on this Map of Morocco north of the Sahara. Unfortunately I was unable to add the areas for different weaving styles to it. 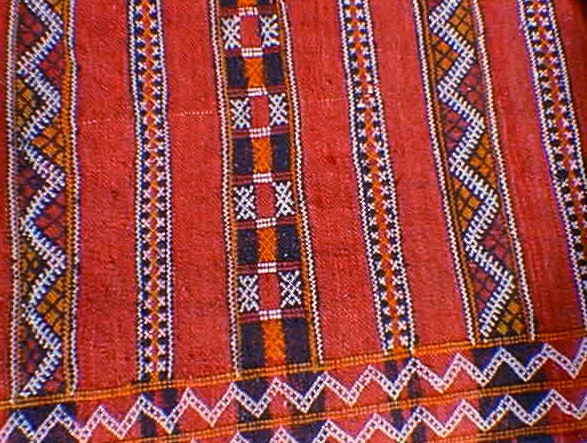 However, Zemmour rugs are made in the area of Khemisset, inland from Rabat on the coast, and Middle Atlas flatweaves are found in the triangle to the southeast of there made up of Azrou, Boulemane and Khenifra. High Atlas pieces come from south of Marrakesh, in the mountain chains north and south of Ouarzazate. 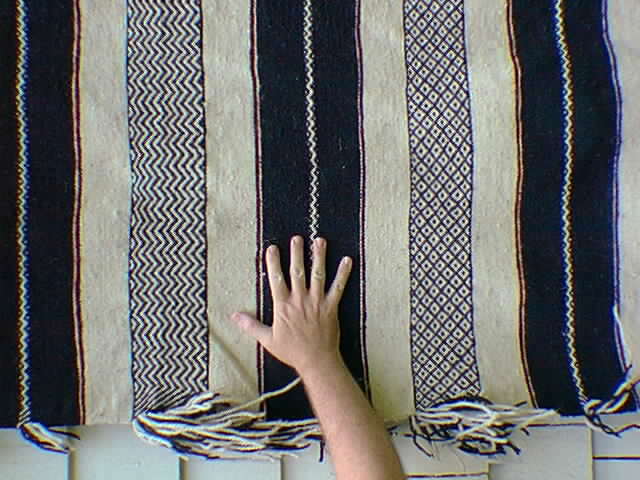 The simplest Moroccan flatwoven pieces are in stripes, and they are used as blankets or floorcoverings (or both) depending on the tightness of the weave. Tighter weaves wear better on the floor. Item 43 is a blanket in this simple style. 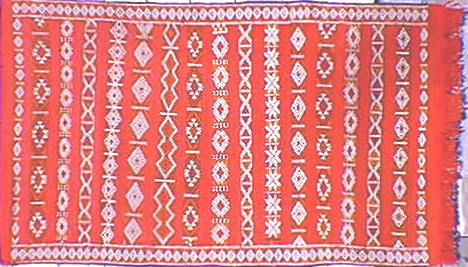 Decoration begins as narrow bands of white cotton and other colors of wool (in skip weft weave, for experts) as in item 34. These bands get closer together and more complex, as seen in a finely woven older Zemmour rug, item 26. The marketing capital of the Zemmour area is Khemisset, about a 1 1/2 hour drive southeast of the capital Rabat. 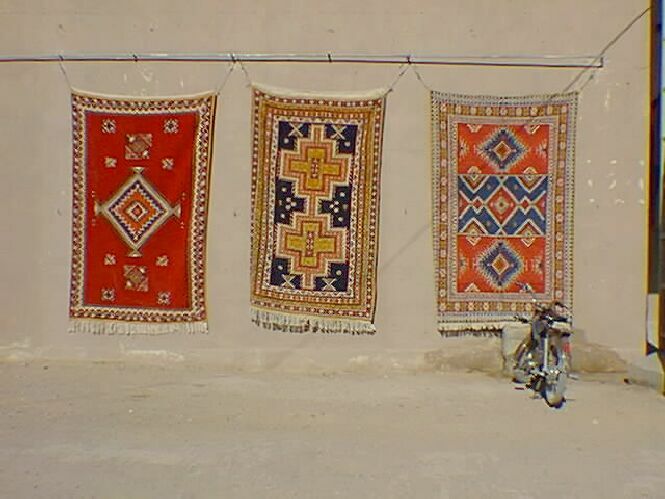 It has an outdoor market where weavers sell their rugs every Tuesday morning -- for those of you with travel plans. 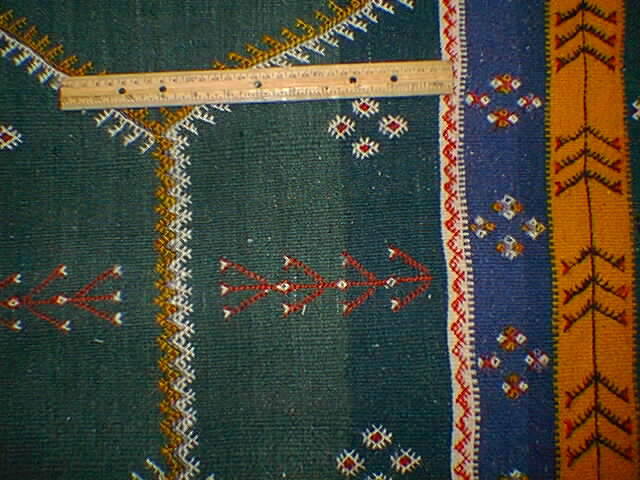 While many of the larger rugs I carry are older and were probably woven for home use, there is an active production of smaller (about 3 x 5) Zemmour rugs for sale. The two pieces above, 8.111413 on the left and 8.111445 on the right, are examples of these. Most new pieces are an intense red like the piece on the right (click here for a close-up), but there is also innovation, as in the cherry color and bolder designs on the left (see close-up). Quality and price vary, but I usually have some very nice items for around $100. 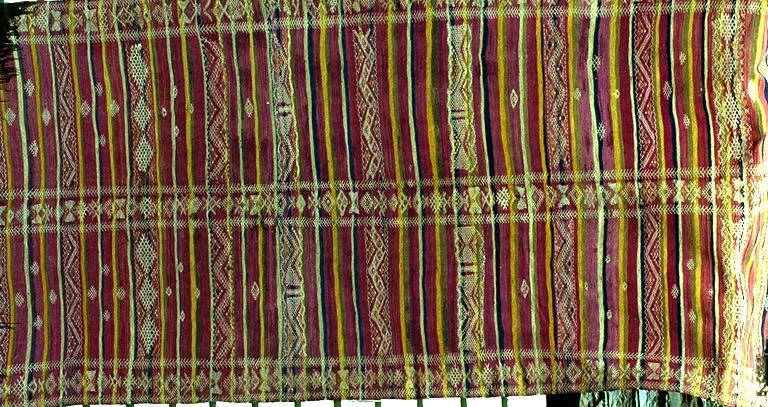 The same weavers also make pillows of similar striped design on one side, often with a more complex front (Item 47C). 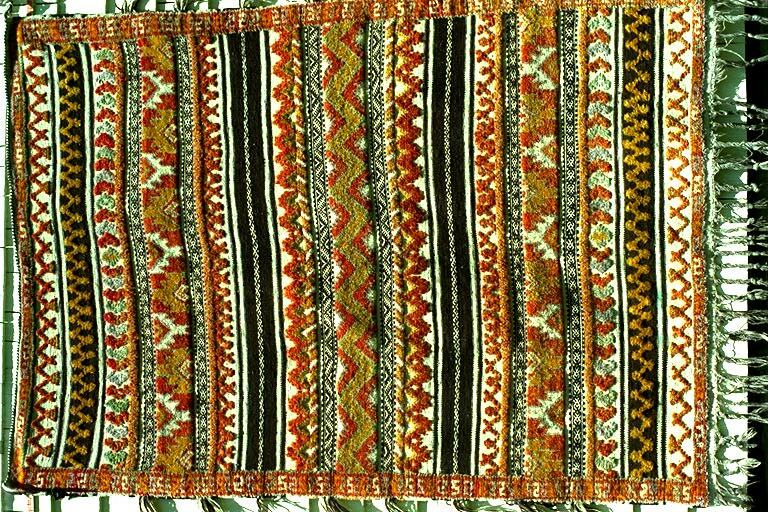 This pillow contains other elements sometimes also found in rugs: a line of knotted fringe, here in orange, and sequins. Dealers will often cut off the sequins because western customers don't like them (and they are sharp underfoot! ), but they look lovely in their original environment: with candle or lantern light. In general, most newer pieces are not as finely woven as the better older ones, and I've wondered if the market in very fine pieces will dry up soon. Happily, this does not seem to be the case. Item 8.111515 was purchased in November 1998 at the Khemisset souk. 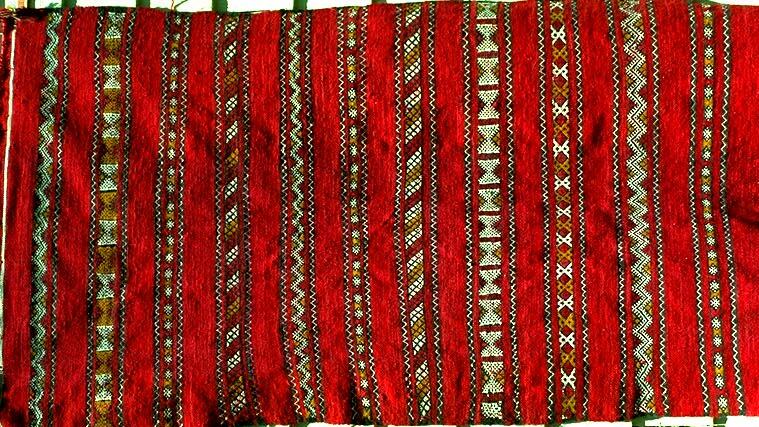 From the dark colors and somewhat unusual design, at first I thought it was from the Middle East. On closer inspection (click here for full screen close-up), it's just more muted colors and some different design elements used in the traditional pattern of stripes. Another encouraging innovation is the wool rugs produced in the area of Tiflet, a town about an hour southeast of Rabat; you pass through it driving from there to Khemisset. 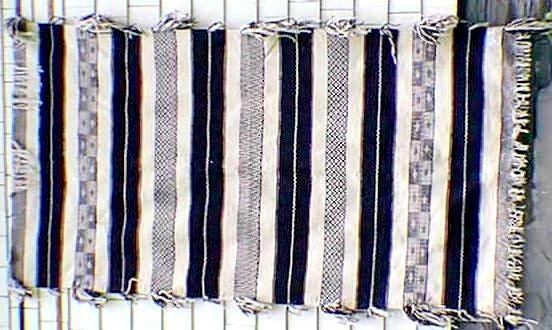 Again based on the Khemisset rugs, these are more finely woven and have more design and fewer plain stripes. Finally, the color palette has changed, and these range from rosy beige to rich rust browns. 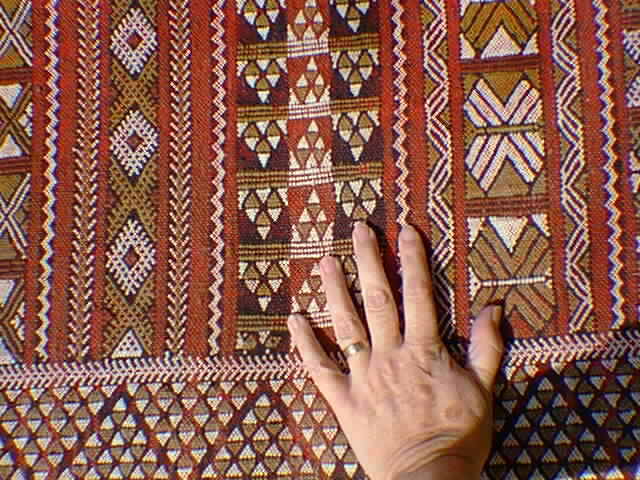 Piece 8.111435 in this close-up is a good example; I've often included a hand so you can see the scale of the weaving. Click the photo to see the overall design of the rug, but I'm afraid the camera couldn't capture the intricate detail at a distance. As you go inland from the Zemmour tribes you encounter the Zayan. 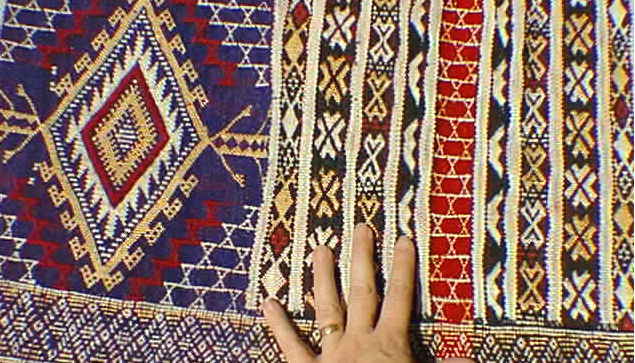 Some of their rugs are similar to the red, white, black and gold Zemmour, but have more complex and colorful design bands, like item 45 above. 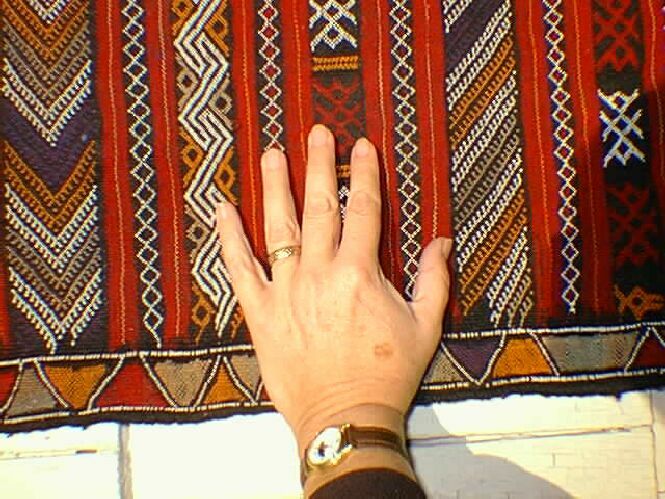 Women's shawls or capes also contain plain and/or design bands. 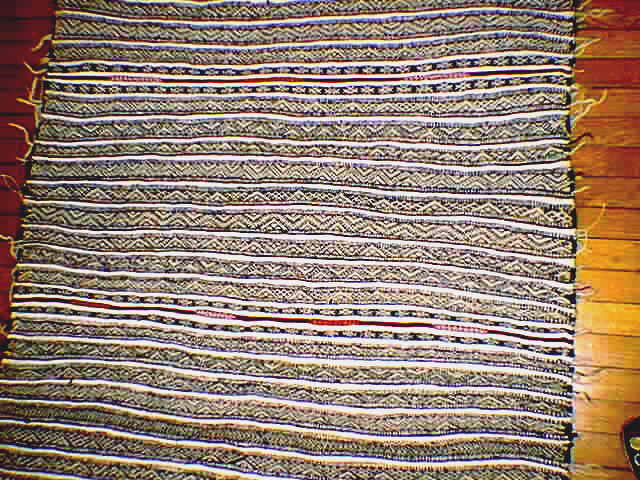 In the mountains north of Fes, the women of the Beni Ouarain tribe weave shawls that appear white at first glance, but looking closely reveals a fine pattern of stripes in black and white, often each with a different design. The image of item 8.051005 is a close-up because the full photo (of a similar piece) doesn't do justice to the this cape with its fine design; the enlarged close-up is even more striking. I included it because many people like the neutral colors and fine, subtle design. The backs of these pieces have the ends of the white threads left about 2-3" long, which provide insulation and warmth in the cold mountain winters. 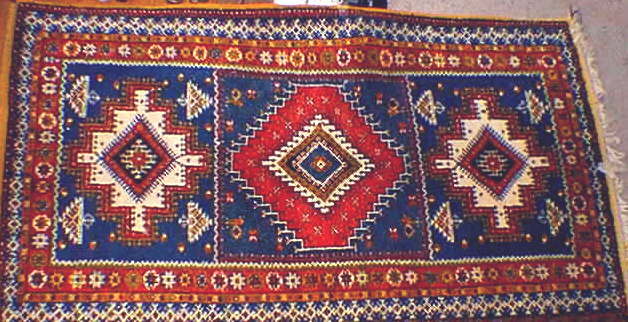 They also make nice bedside rugs, and such pieces are still readily available. As you move inland East into the mountains around the Berber town of Azrou, the rug patterns get more complex, and there are vertical as well as horizontal designs in white. 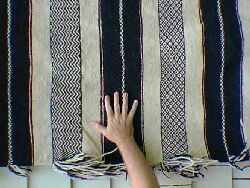 The white parts of item 30 are especially delicate-looking because they are done in wool rather than the usual cotton. There is more area devoted to design bands than plain ones in item 28, and the vertical bands are staggered. In comparing items 44 and 23, you can see how the same colors (based on gentle mauves) and general designs produce two very different rugs. Item 44 is quite simple, with delicate vertical designs at the sides and center. 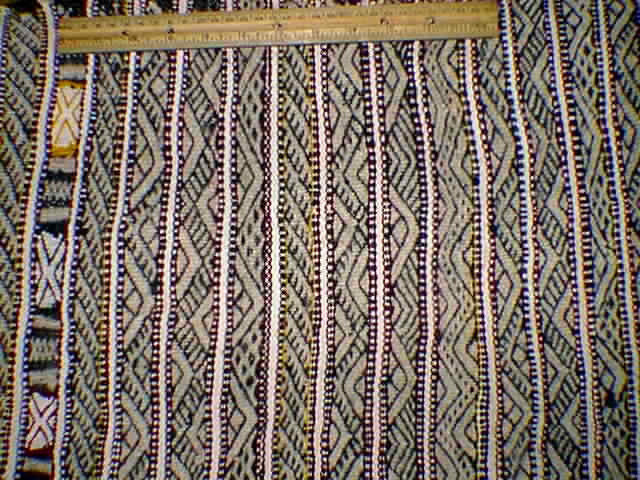 Item 23 has mainly horizontal designs except small tufts of cotton running vertically, yet it is quite complex (click it to see more clearly). A quick side trip to the High Atlas mountains south of Marrakesh shows examples of stripes and complexity from another part of the country, achieved by different techniques. Parallel to the very first piece in the Gallery, this area also produces flatweave blankets/floor pieces in stripes, but they look very different. 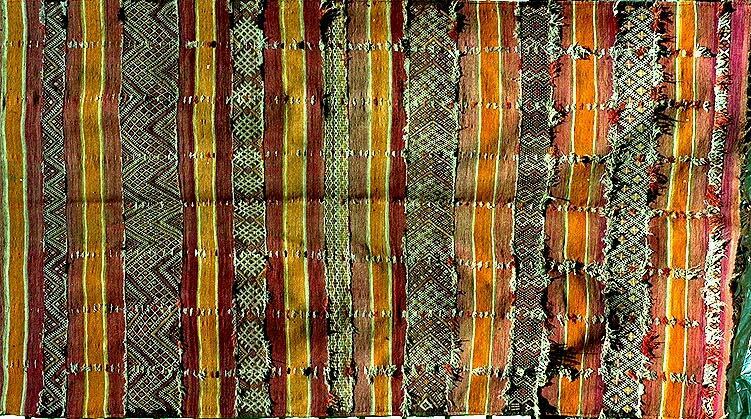 Both pieces above have stripes produced by two techniques, plain weaving and twining. 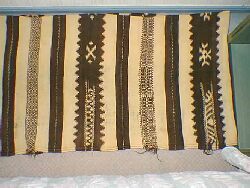 In the one on the left, made with natural brown and white wool, the weaver introduced some almost-curves. The righthand piece is in black and white, neither natural colors. The twining (click here for a closer view) produces various design stripes, but only in the two basic colors. The two pieces described above are traditional, but in the summer of 1997 I saw a new style in Marrakesh for the first time. 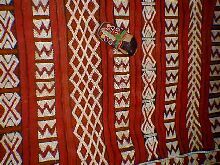 Merchants called it "akhnif", after the black men's capes with a red 'eye' woven on the back and decorated with embroidery. 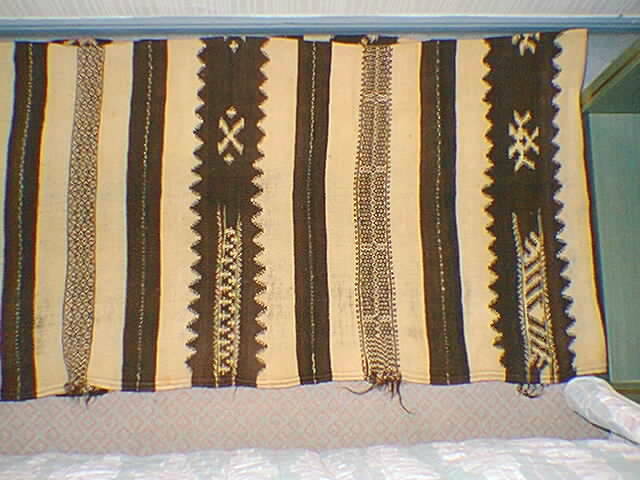 These pieces are also flatweaves and decorated with embroidery; sometimes they also have a pile design or border. Click here to enjoy the detail. The colors are lovely, often using a rosy salmon reminiscent of the walls of Marrakesh combined with different shades of indigo blue. However, my rug dealer friends warn me that the colors fade rapidly - even with no exposure to the sun, plus the wool is quite harsh, and the embroidery will wear off with much foot traffic. So while they are lovely to look at, they may not stand the test of time. 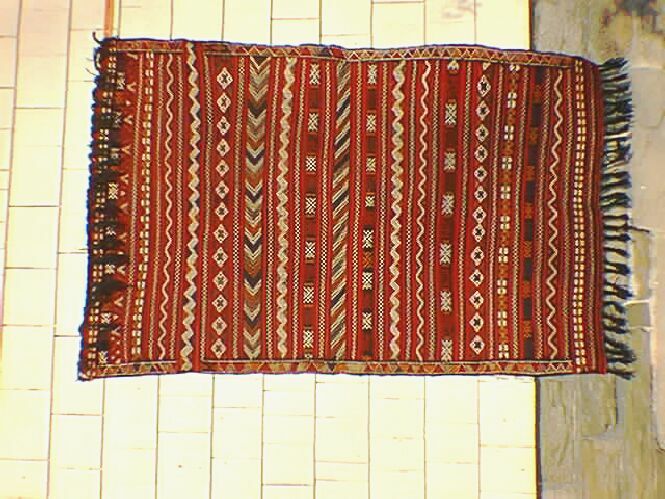 Another traditional style of rug from the High Atlas is the Glawa, named after a tribe that dominated the area. 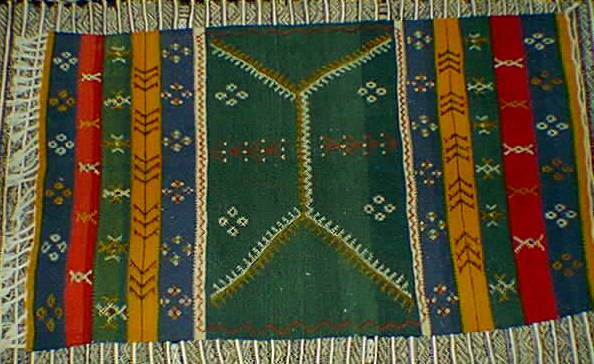 Glawa rugs have alternating bands of flatweave, pile, and twining. They are usually in rich reds and golds with black and white, but sometimes they are in blues, browns and golds with black and white. 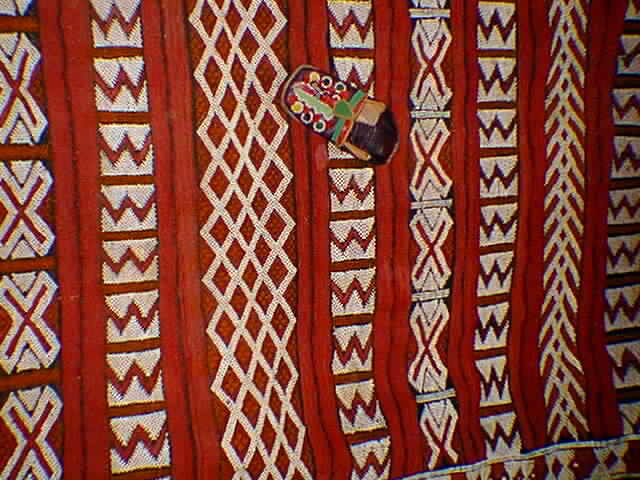 Some modern ones include embroidered designs on the plain stripes as well. 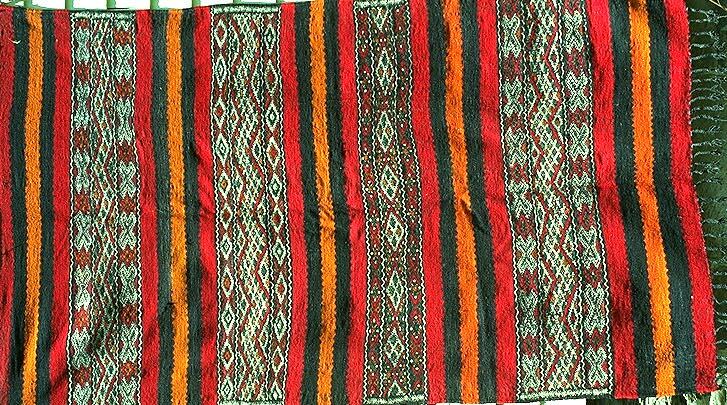 The red, gold and light green bands in item 38 are pile, the plain black and white flatwoven, and the bands with both black and white are twined. These rugs too are readily available, and the rich, intense colors of new pieces are not jarring, given the limited palette. 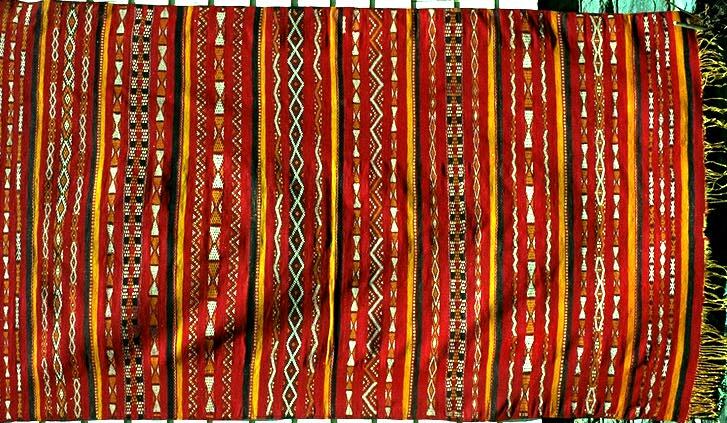 Since we're in the High Atlas, even though those rugs are quite different from my main topic, because they're so attractive you should see a couple of examples of High Atlas pile rugs. 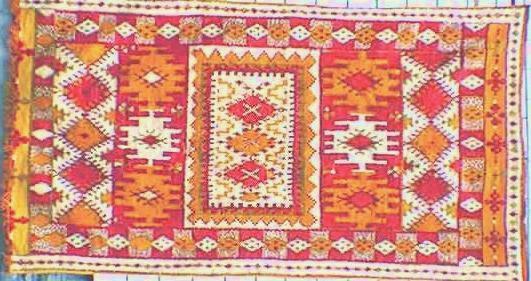 Usually the warp of these rugs is a rich gold or orange, and you see that color on the front, often with rich reds (8.061020) as in the Glawa carpets. A variation uses lots of blue (8.020901), favored by European and American customers. The designs are no longer in stripes, but have a central area with borders. 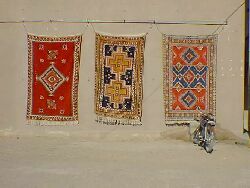 This photo of rugs hung on the wall outside a shop in Tazenakht gives you a little bit of the local atmosphere in southern Morocco. 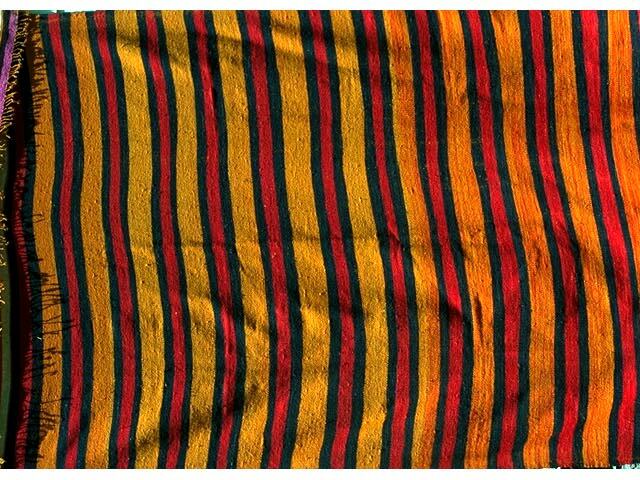 Moving back the the Middle Atlas pieces, where we've seen increasingly complex patterns based on stripes, finally the stripes may nearly disappear. Instead rugs have an overall design of diamonds or chevrons in lacy white on colored wool. You can almost see this evolution happening in a black piece (item 35) that was once the wall of a tent (as many pieces described as runners were; traditional homes are built around a courtyard and don't have hallways). This piece has lacy white designs in both stripes and an overall pattern. 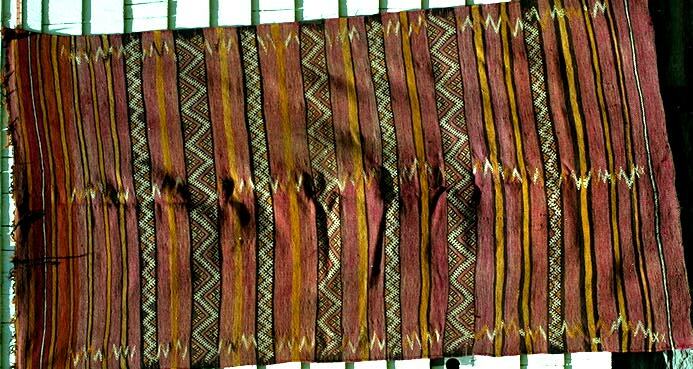 This long piece (item 40) in rich dark colors has both diamonds and chevrons, separated into horizontal patterns by fine stripes of white cotton tufts. I mentioned above that pillows often have rug patterns. Pillow 49 has an overall pattern like the previous rug. Both are from the mountains in the Azrou-Midelt-Khenifra area. 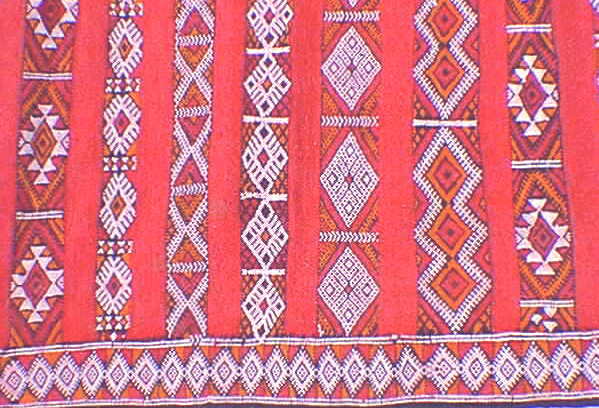 Another variation on overall design is seen in the pillows in image 46, which are embroidered rather than woven. Their snowflake-like patterns are derived from embroidery done on women's trousseau linens in the city of Fes. These are modern versions made by friends of mine. 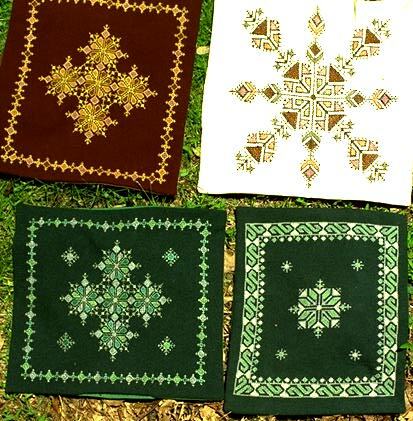 They are done on machine-made fabric, and can be obtained in any color combination. 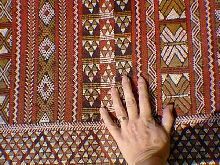 While the overall designs above are traditional, there are two relatively new style of flatweaves being produced by Middle Atlas weavers that also have overall designs. 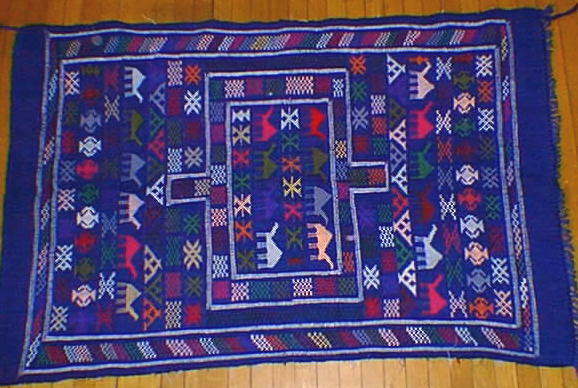 This blue piece is in a style often called "Oued Zem", named after an area south of Casablanca, or alternately "children's rugs." The latter is more descriptive, since they contain motifs of animals and objects like teapots or cars on a brightly-colored background, apropriate for a child's room. They are 'naive' or usually not expertly woven, and often correspondingly inexpensive. 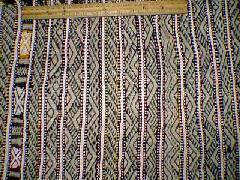 They are also one of the few styles now woven in a more square rather than rectangular shape, and they range from about 2 x 3 to 5 x 7 or larger. 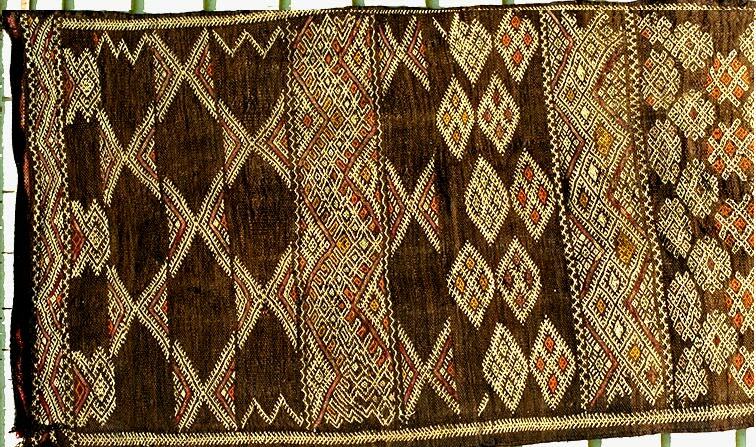 Another variation of overall design, featuring a central medallion with strong elements of stripes, is at the other end of the scale in terms of fineness and weaving skill. 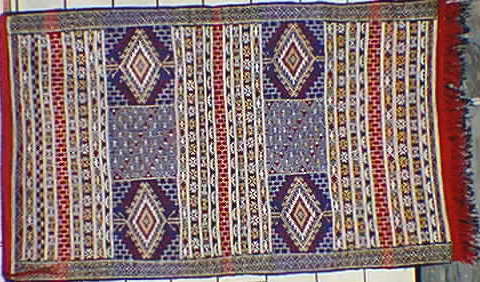 Blues or violets are usually dominant, colors not often found in Middle Atlas rugs. The warp is cotton, but the main design material is a shiny synthetic thread that is called the same word as 'silk' in Moroccan Arabic but that is definitely not silk. Because it is spun much finer than wool, the design can be much finer, as in piece 8.111419. You can really see the fine weave in this close-up. Americans like the fineness and colors of these pieces, but they must be carefully used. Colors may run if spilled on, and there can be color fade-through if they are placed on another carpet without a pad. If you'd like to see even more Moroccan rugs, see whether your local PBS station carries the program "Oriental Rugs et al." 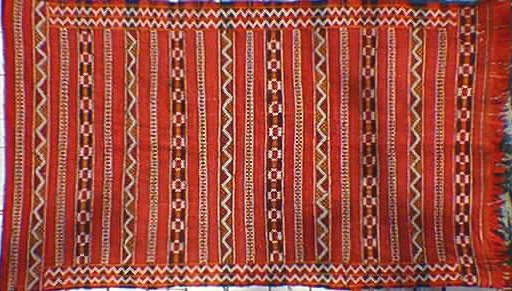 In 1993, I was on two segments with another Moroccan textile enthusiast, Brooke Pickering. And if you'd like to learn about other types of Moroccan textiles, see the video listed in the shop: "Threads of Time" features Moroccan wedding textiles (and a wedding). I was the resident ethnographer with the three museum curators - Louise Mackie, Lotus Stack and Frieda Sorber - who produced it. To see what's for sale, click Shop . You may also return to the Introduction. Copyright (C) Susan S. Davis 1994-2014. All rights reserved.